(1943, Monogram) Bela Lugosi, Wallace Ford, Henry Hall, Louise Currie, Minerva Urecal. 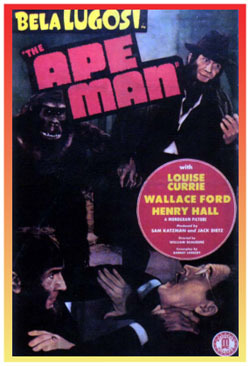 During a series of bizarre experiments, mad scientist Lugosi literally goes ape--turning into a half man/half ape monstrosity that needs Human spinal fluid to return to any semblance of normalcy. 16mm.